Though absolutely no fight fan disputes the punching power the ultimately unhinged Edwin Valero possessed – the man who committed suicide after murdering his wife back in 2010 scored a straight 27 KO’s during his electricity-packed career; a truly amazing nineteen of these KO’s coming inside a single round – nobody will ever know how good, great even, he might have become had he lived. Tantalisingly, there was a time when a fight between Valero and Manny Pacquiao was close to happening. And what a truly epic, savage and memorable battle this one would surely have been. What would have transpired in the ring if Valero had lived to get that dream fight with then then reigning pound-for-pound king? We know Valero, totally unafraid, possessed even, would not have shown any trepidation. No, Valero, a truly hurtful banger, would have slung out leather with bad intentions for as long as he was able. And as we found out in his final war with arch-rival Juan Manuel Marquez, Pacquiao could be taken out, with one shot (admittedly a great shot; maybe even a once in a career shot) even when he was in his prime. But was Valero ever going to be good enough to rumble with the likes of Pac-Man? At 5’6,″ Valero, it could be argued, had the necessary height and reach to make it as a 140 pound fighter/champion, and his withering, one-punch KO power would have always given him a chance against ANY fighter he met in the ring – Pac-Man included. On the minus side, though, was Valero’s crudeness and his less than granite chin. Valero, if he had met a more skilled boxer like Manny, would likely have been made to miss by a mile or two with some, if not most of his punches. And when under return fire, Valero could be sent to the canvas himself; something Vicente Mosquera proved in his August 2006 fight with the Venezuelan. 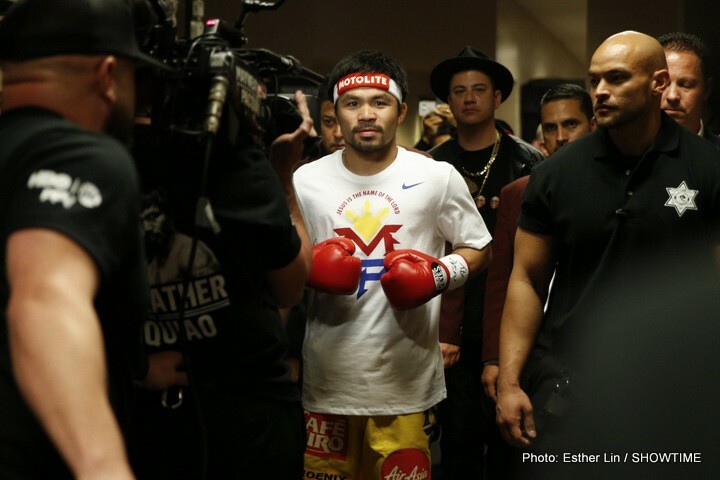 Would Valero have been able to take Pacquiao’s best and keep coming? Of course we’ll never know for sure, but just maybe, if Valero had met Pacquiao we would have seen a wildly entertaining few rounds before Valero took the inevitable punch too many and got stopped. Maybe, just maybe, a Pacquiao-Valero collision would have even topped the still celebrated Hagler-Hearns war for greatest short fight? Had Valero lived, he may well have got that fight he wanted with Pacquiao, and it’s not totally crazy to say the wild man’s style might, just might, have given Manny trouble and even beaten him. One thing we can all agree on is how exciting it would have been if we’d been allowed to find out who would have come out on top between the two fast and heavy-handed southpaws. File this one under the ‘Lost Classics’ department. Next boxing news: A Sparring Partner Talks: Deontay Wilder Hits Six Times Harder Than Anthony Joshua!